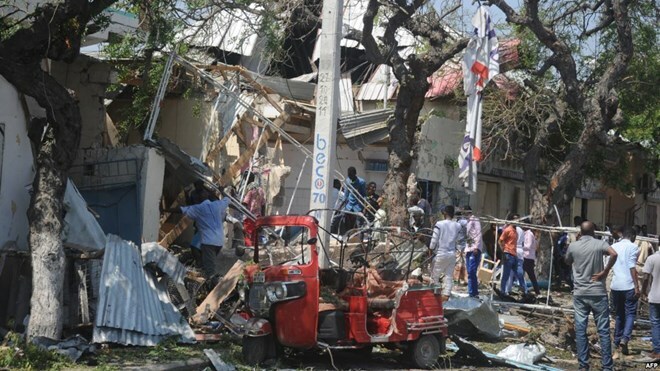 People gather at the scene of an explosion outside a restaurant in Mogadishu, March 28, 2019. “What is hurting the family is that Ahmed endured and suffered during his journey to America, and eventually he got deported to Somalia,” his older stepsister, Fatima Salah Hassan, told VOA’s Somali service in a phone call late Sunday. She said she and other relatives didn’t understand why he was sent back to his homeland, given the country’s insecurity and the fact that he had committed no crime. “The unfortunate thing is, in Mogadishu, we’ve had 30 years of civil war,” she said. In January 2017, “he was removed from the U.S. after receiving appropriate legal process that found he had no lawful basis to remain in the country,” ICE reported in an email to VOA.